This price was arbitrarily determined by Queensridge Mining Resources, Inc. Estimated solely for the purpose of calculating the registration fee in accordance with Rule 457(a) under the Securities Act. THE REGISTRANT HEREBY AMENDS THIS REGISTRATION STATEMENT ON SUCH DATE OR DATES AS MAY BE NECESSARY TO DELAY ITS EFFECTIVE DATE UNTIL THE REGISTRANT SHALL FILE A FURTHER AMENDMENT WHICH SPECIFICALLY STATES THAT THIS REGISTRATION STATEMENT SHALL THEREAFTER BECOME EFFECTIVE IN ACCORDANCE WITH SECTION 8(a) OF THE SECURITIES ACT OF 1933 OR UNTIL THE REGISTRATION STATEMENT SHALL BECOME EFFECTIVE ON SUCH DATE AS THE COMMISSION, ACTING PURSUANT TO SECTION 8(a), MAY DETERMINE. The selling shareholders named in this prospectus are offering up to 1,702,800 shares of common stock offered through this prospectus. We will not receive any proceeds from this offering and have not made any arrangements for the sale of these securities. We have, however, set an offering price for these securities of $0.25 per share. We will use our best efforts to maintain the effectiveness of the resale registration statement from the effective date through and until all securities registered under the registration statement have been sold or are otherwise able to be sold pursuant to Rule 144 promulgated under the Securities Act of 1933. Our common stock is presently not traded on any market or securities exchange. The sales price to the public is fixed at $0.25 per share until such time as the shares of our common stock are traded on the Over-The-Counter Bulletin Board. Although we intend to apply for quotation of our common stock on the Over-The-Counter Bulletin Board, public trading of our common stock may never materialize. If our common stock becomes traded on the Over-The-Counter Bulletin Board, then the sale price to the public will vary according to prevailing market prices or privately negotiated prices by the selling shareholders. The purchase of the securities offered through this prospectus involves a high degree of risk. See section of this Prospectus entitled "Risk Factors." The information in this prospectus is not complete and may be changed. We may not sell these securities until the registration statement filed with the Securities and Exchange Commission is effective. The prospectus is not an offer to sell these securities and it is not soliciting an offer to buy these securities in any state where the offer or sale is not permitted. Because we conduct our business through verbal agreements with consultants and arms-length third parties, there is a substantial risk that such persons may not be readily available to us and the implementation of our business plan could be impaired. Because our president, Mr. Phillip Stromer, owns 48.23% of our outstanding common stock the market price of our shares would most likely decline if he were to sell a substantial number of shares all at once or in large blocks. If we are unable to successfully compete within the mineral exploration business, we will not be able to achieve profitable operations. Because of factors beyond our control which could affect the marketability of any substances found, we may have difficulty selling any substances we discover. If Native land claims affect the title to our mineral claims, our ability to prospect the mineral claims may be lost. Because the Province of Newfoundland and Labrador owns the land covered by the Cutwell Harbour mineral claims, our availability to conduct an exploratory program on the Cutwell Harbour mineral claims is subject to the consent of the Province of Newfoundland and Labrador and we can be ejected from the land and our interest in the land could be forfeit. Because new legislation, including the Sarbanes-Oxley Act of 2002, increases the cost of compliance with federal securities regulations as well as the risks of liability to officers and directors, we may find it more difficult for us to retain or attract officers and directors. Because we will subject to the “Penny Stock” rules once our shares are quoted on the over-the-counter bulletin board the level of trading activity in our stock may be reduced. If our shares are quoted on the over-the-counter bulletin board, we will be required to remain current in our filings with the SEC and our securities will not be eligible for quotation if we are not current in our filings with the SEC. We are in the business of mineral exploration. We have acquired a 100% interest in the Cutwell Harbour block of minerals claim located in northern Newfoundland in Canada. Our ownership in the Cutwell Harbour claims was electronically staked and recorded under the electronic mineral claim staking and recording procedures of the Online Mineral Claims Staking System administered by the Department of Natural Resources, Government of Newfoundland and Labrador, Canada. A party is able to stake and record an interest in a particular mineral claim if no other party has an interest in the said claim that is in good standing and on record. There is no formal agreement between us and the Government of Newfoundland and Labrador. We have not commenced our planned exploration program. Our plan of operations is to conduct mineral exploration activities on the Cutwell Harbour mineral claims in order to assess whether these claims possess commercially exploitable mineral deposits. Our exploration program is designed to explore for commercially viable deposits of gold and other metallic minerals. We have not, nor to our knowledge has any predecessor, identified any commercially exploitable reserves of these minerals on the Cutwell Harbour mineral claims. We are an exploration stage company and there is no assurance that a commercially viable mineral deposit exists on the Cutwell Harbour mineral claims. The mineral exploration program, consisting of geological mapping, sampling, and geochemical analyses is oriented toward identifying areas of vein or stockwork mineralization within the Cutwell Harbour mineral claims. Currently, we are uncertain of the number of mineral exploration phases we will conduct before concluding whether there are commercially viable minerals present on the Cutwell Harbour mineral claims. Further phases beyond the current exploration program will be dependent upon a number of factors such as a consulting geologist’s recommendations based upon ongoing exploration program results, and our available funds. Since we are in the exploration stage of our business plan, we have not yet earned any revenues from our planned operations. As of June 30, 2010, we had $35,065 cash on hand and current liabilities in the amount of $7,810. Accordingly, our working capital position as of June 30, 2010 was $27,255. Since our inception through June 30, 2010, we have incurred a net loss of $11,545. We attribute our net loss to having no revenues to offset our expenses and the professional fees related to the creation and operation of our business. Our management estimates that, until such time that we are able to identify a commercially viable mineral deposit and to generate revenue from the extraction of precious metals on our mineral claims, we will experience negative cash flow in the approximate average amount of $3,000 to $4,000 per month. Our fiscal year end is June 30. We were incorporated on January 29, 2010, under the laws of the state of Nevada. Our principal offices are located at 912 Sir James Bridge Way, Las Vegas, Nevada 89145. Our resident agent is Val-U-Corp Services, Inc., 1802 N. Carson St., #212, Carson City, NV 89701. Our phone number is (702) 596-5154. Up to 1,702,800 shares of our common stock. The offering price of the common stock is $0.25 per share. We intend to apply to the over-the-counter bulletin board to allow the trading of our common stock upon our becoming a reporting entity under the Securities Exchange Act of 1934. If our common stock becomes so traded and a market for the stock develops, the actual price of stock will be determined by prevailing market prices at the time of sale or by private transactions negotiated by the selling shareholders. The offering price would thus be determined by market factors and the independent decisions of the selling shareholders. Securities Issued and to be Issued 6,427,800 shares of our common stock are issued and outstanding as of the date of this prospectus. All of the common stock to be sold under this prospectus will be sold by existing shareholders. There will be no increase in our issued and outstanding shares as a result of this offering. Use of Proceeds We will not receive any proceeds from the sale of the common stock by the selling shareholders. You should consider each of the following risk factors and any other information set forth herein and in our reports filed with the SEC, including our financial statements and related notes, in evaluating our business and prospects. The risks and uncertainties described below are not the only ones that impact on our operations and business. Additional risks and uncertainties not presently known to us, or that we currently consider immaterial, may also impair our business or operations. If any of the following risks actually occur, our business and financial results or prospects could be harmed. In that case, the value of the Common Stock could decline. As of June 30, 2010, we had cash in the amount of $35,065. Our cash on hand will allow us to complete the initial work program recommended by our consulting geologist. The recommended work program will consist of mapping, sampling, and geochemical analyses aimed at identifying and locating potential gold deposits on the Cutwell Harbour property. If significant additional exploration activities are warranted and recommended by our consulting geologist, we will likely require additional financing in order to move forward with our development of the claim. We currently do not have any operations and we have no income. We will require additional financing to sustain our business operations if we are not successful in earning revenues once exploration is complete. If our exploration programs are successful in discovering reserves of commercial tonnage and grade, we will require significant additional funds in order to place the Cutwell Harbour property into commercial production. We currently do not have any arrangements for financing and we may not be able to obtain financing when required. Obtaining additional financing would be subject to a number of factors, including the market prices for gold and other metallic minerals and the costs of exploring for or commercial production of these materials. These factors may make the timing, amount, terms or conditions of additional financing unavailable to us. We have incurred a net loss of $11,545 for the period from our inception, January 29, 2010, to June 30, 2010, and have no sales. Our future is dependent upon our ability to obtain financing and upon future profitable operations from the commercial exploitation of an interest in mineral claims. Our auditors have issued a going concern opinion and have raised substantial doubt about our continuance as a going concern. When an auditor issues a going concern opinion, the auditor has substantial doubt that the company will continue to operate indefinitely and not go out of business and liquidate its assets. This is a significant risk to investors who purchase shares of our common stock because there is an increased risk that we may not be able to generate and/or raise enough resources to remain operational for an indefinite period of time. Potential investors should also be aware of the difficulties normally encountered by new mineral exploration companies and the high rate of failure of such enterprises. The auditor’s going concern opinion may inhibit our ability to raise financing because we may not remain operational for an indefinite period of time resulting in potential investors failing to receive any return on their investment. There is no history upon which to base any assumption as to the likelihood that we will prove successful, and it is doubtful that we will generate any operating revenues or ever achieve profitable operations. If we are unsuccessful in addressing these risks, our business will most likely fail. Because we have only recently commenced business operations, we face a high risk of business failure. We have just planned the initial stages of exploration on our recently –staked mineral claims. As a result, we have no way to evaluate the likelihood that we will be able to operate the business successfully. We were incorporated on January 29, 2010, and to date have been involved primarily in organizational activities, the staking of our mineral claim, and obtaining independent consulting geologist’s report on this mineral claim. We have not earned any revenues as of the date of this prospectus, and thus face a high risk of business failure. Mr. Phillip Stromer, our president and director, does not have any training as a geologist or an engineer. As a result, our management may lack certain skills that are advantageous in managing an exploration company. In addition, Mr. Stromer’s decisions and choices may not take into account standard engineering or managerial approaches mineral exploration companies commonly use. Consequently, our operations, earnings, and ultimate financial success could suffer irreparable harm due to management’s lack of experience in geology and engineering. We have a verbal agreement with our consulting geologist that requires him to review all of the results from the exploration work performed upon the mineral claim that we have purchased and then make recommendations based upon those results. In addition, we have a verbal agreement with our accountants to perform requested financial accounting services and our outside auditors to perform auditing functions. Each of these functions requires the services of persons in high demand and these persons may not always be available. The implementation of our business plan may be impaired if these parties do not perform in accordance with our verbal agreement. In addition, it may be difficult to enforce a verbal agreement in the event that any of these parties fail to perform. Because of the unique difficulties and uncertainties inherent in the mineral exploration business, we face a high risk of business failure. Potential investors should be aware of the difficulties normally encountered by new mineral exploration companies and the high rate of failure of such enterprises. The likelihood of success must be considered in light of the problems, expenses, difficulties, complications and delays encountered in connection with the exploration of the mineral properties that we plan to undertake. These potential problems include, but are not limited to, unanticipated problems relating to exploration, and additional costs and expenses that may exceed current estimates. The search for valuable minerals also involves numerous hazards. As a result, we may become subject to liability for such hazards, including pollution, cave-ins and other hazards against which we cannot insure or against which we may elect not to insure. At the present time, we have no coverage to insure against these hazards. The payment of such liabilities may have a material adverse effect on our financial position. In addition, there is no assurance that the expenditures to be made by us in the exploration of the mineral claims will result in the discovery of mineral deposits. Problems such as unusual or unexpected formations and other conditions are involved in mineral exploration and often result in unsuccessful exploration efforts. Because we anticipate our operating expenses will increase prior to our earning revenues, we may never achieve profitability. Prior to completion of our exploration stage, we anticipate that we will incur increased operating expenses without realizing any revenues. We expect to incur continuing and significant losses into the foreseeable future. As a result of continuing losses, we may exhaust all of our resources and be unable to complete the exploration of the Cutwell Harbour property. Our accumulated deficit will continue to increase as we continue to incur losses. We may not be able to earn profits or continue operations if we are unable to generate significant revenues from the exploration of the mineral claims if we exercise our option. There is no history upon which to base any assumption as to the likelihood that we will be successful, and we may not be able to generate any operating revenues or ever achieve profitable operations. If we are unsuccessful in addressing these risks, our business will most likely fail. Because we will incur additional costs as the result of becoming a public company, our cash needs will increase and our ability to achieve net profitability may be delayed. Upon effectiveness of the Registration Statement for the Offering, we will become a publicly reporting company and will be required to stay current in our filings with the SEC, including, but not limited to, quarterly and annual reports, current reports on materials events, and other filings that may be required from time to time. We believe that, as a public company, our ongoing filings with the SEC will benefit shareholders in the form of greater transparency regarding our business activities and results of operations. In becoming a public company, however, we will incur additional costs in the form of audit and accounting fees and legal fees for the professional services necessary to assist us in remaining current in our reporting obligations. We expect that, during our first year of operations following the effectiveness of our Registration Statement, we will occur additional costs for professional fees in the approximate amount of $20,000. These additional costs will increase our cash needs and may hinder or delay our ability to achieve net profitability even after we have begun to generate revenues from the extraction of minerals on our mining claims. Because our president has only agreed to provide his services on a part-time basis, he may not be able or willing to devote a sufficient amount of time to our business operations, causing our business to fail. Mr. Stromer, our president and chief financial officer, devotes 5 to 10 hours per week to our business affairs. We do not have an employment agreement with Mr. Stromer nor do we maintain a key man life insurance policy for him. Currently, we do not have any full or part-time employees. If the demands of our business require the full business time of Mr. Stromer, it is possible that Mr. Stromer may not be able to devote sufficient time to the management of our business, as and when needed. If our management is unable to devote a sufficient amount of time to manage our operations, our business will fail. Because our president, Mr. Phillip Stromer owns 48.23% of our outstanding common stock, investors may find that corporate decisions influenced by Mr. Stromer are inconsistent with the best interests of other stockholders. Mr. Stromer is our president, chief financial officer and sole director. He owns 48.23% of the outstanding shares of our common stock. Accordingly, he will have a significant influence in determining the outcome of all corporate transactions or other matters, including mergers, consolidations and the sale of all or substantially all of our assets, and also the power to prevent or cause a change in control. While we have no current plans with regard to any merger, consolidation or sale of substantially all of its assets, the interests of Mr. Stromer may still differ from the interests of the other stockholders. Because our president, Mr. Phillip Stromer, owns 48.23% of our outstanding common stock, the market price of our shares would most likely decline if he were to sell a substantial number of shares all at once or in large blocks. Our president, Mr. Phillip Stromer, owns 3,100,000 shares of our common stock which equates to 48.23% of our outstanding common stock. There is presently no public market for our common stock and we plan to apply for quotation of our common stock on the over-the-counter bulletin board upon the effectiveness of the registration statement of which this prospectus forms a part. If our shares are publicly traded on the over-the-counter bulletin board, Mr. Stromer will eventually be eligible to sell his shares publicly subject to the volume limitations in Rule 144. The offer or sale of a large number of shares at any price may cause the market price to fall. Sales of substantial amounts of common stock or the perception that such transactions could occur, may materially and adversely affect prevailing markets prices for our common stock. The mineral exploration business is highly competitive. This industry has a multitude of competitors and no small number of competitors dominates this industry with respect to any of the large volume metallic minerals. Our exploration activities will be focused on attempting to locate commercially viable gold deposits on the Cutwell Harbour property. Many of our competitors have greater financial resources than us. As a result, we may experience difficulty competing with other businesses when conducting mineral exploration activities on the Cutwell Harbour property. If we are unable to retain qualified personnel to assist us in conducting mineral exploration activities on the Cutwell Harbour property if a commercially viable deposit is found to exist, we may be unable to enter into production and achieve profitable operations. Because of factors beyond our control which could affect the marketability of any substances found, we may be difficulty selling any substances we discover. Even if commercial quantities of reserves are discovered, a ready market may not exist for the sale of the reserves. Numerous factors beyond our control may affect the marketability of any substances discovered. These factors include market fluctuations, the proximity and capacity of natural resource markets and processing equipment, government regulations, including regulations relating to prices, taxes, royalties, land tenure, land use, importing and exporting of minerals and environmental protection. These factors could inhibit our ability to sell minerals in the event that commercial amounts of minerals are found. There are several governmental regulations that materially restrict mineral exploration or exploitation. We may be required to obtain work permits, post bonds and perform remediation work for any physical disturbance to the land in order to comply with these regulations. Currently, we have not experienced any difficulty with compliance of any laws or regulations which affect our business. While our planned exploration program budgets for regulatory compliance, there is a risk that new regulations could increase our costs of doing business, prevent us from carrying out our exploration program, and make compliance with new regulations unduly burdensome. We are unaware of any outstanding native land claims on the Cutwell Harbour property. Notwithstanding, it is possible that a native land claim could be made in the future. The federal and provincial government policy is at this time is to consult with all potentially affected native bands and other stakeholders in the area of any potential commercial production. In the event that we encounter a situation where a native person or group claims an interest in the Cutwell Harbour property, we may be unable to provide compensation to the affected party in order to continue with our exploration work, or if such an option is not available, we may have to relinquish any interest that we may have in this claim. The Supreme Court of Canada has ruled that both the federal and provincial governments in Canada are obliged to negotiate these matters in good faith with native groups and at no cost to us. Notwithstanding, the costs and/or losses could be greater than our financial capacity and our business would fail. Because the Province of Newfoundland owns the land covered by the Cutwell Harbour property, our availability to conduct an exploratory program on the Cutwell Harbour property is subject to the consent of the Government of Newfoundland and Labrador and we can be ejected from the land and our interest in the land could be forfeit. The land covered by the Cutwell Harbour property is owned by the Government of Newfoundland and Labrador. 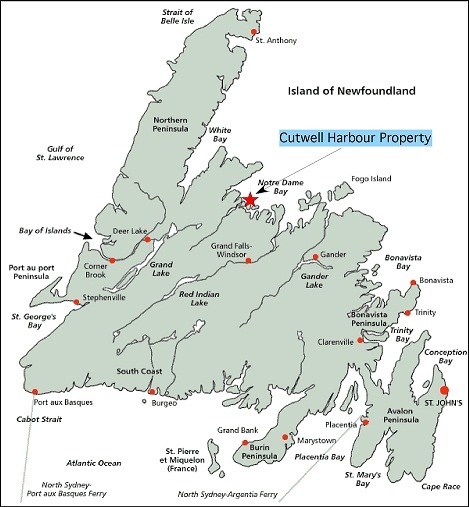 The availability to conduct an exploratory program on the Cutwell Harbour property is subject to the consent of the Government of Newfoundland and Labrador. In order to keep the Cutwell Harbour claims in good standing with the Government of Newfoundland and Labrador, the Government of Newfoundland and Labrador requires that before the expiry dates of the mineral claims that exploration work on the mineral claim valued at an amount stipulated by the government be completed together with the payment of a filing fee or payment to the Government of Newfoundland and Labrador in lieu of completing exploration work. In the event that these conditions are not satisfied prior to the expiry dates of the mineral claims, we will lose our interest in the mineral claim and the mineral claim then become available again to any party that wishes to stake an interest in these claims. In the event that either we are ejected from the land or our mineral claims expire, we will lose all interest that we have in the Cutwell Harbour mineral claims. The Sarbanes-Oxley Act of 2002 was enacted in response to public concerns regarding corporate accountability in connection with recent accounting scandals. The stated goals of the Sarbanes-Oxley Act are to increase corporate responsibility, to provide for enhanced penalties for accounting and auditing improprieties at publicly traded companies, and to protect investors by improving the accuracy and reliability of corporate disclosures pursuant to the securities laws. The Sarbanes-Oxley Act generally applies to all companies that file or are required to file periodic reports with the SEC, under the Securities Exchange Act of 1934. Upon becoming a public company, we will be required to comply with the Sarbanes-Oxley Act and it is costly to remain in compliance with the federal securities regulations. Additionally, we may be unable to attract and retain qualified officers, directors and members of board committees required to provide for our effective management as a result of Sarbanes-Oxley Act of 2002. The enactment of the Sarbanes-Oxley Act of 2002 has resulted in a series of rules and regulations by the SEC that increase responsibilities and liabilities of directors and executive officers. The perceived increased personal risk associated with these recent changes may make it more costly or deter qualified individuals from accepting these roles. Significant costs incurred as a result of becoming a public company could divert the use of finances from our operations resulting in our inability to achieve profitability. A market for our common stock may never develop. We currently plan to apply for quotation of our common stock on the over-the-counter bulletin board upon the effectiveness of the registration statement of which this prospectus forms a part. However, our shares may never be traded on the bulletin board, or, if traded, a public market may not materialize. If our common stock is not traded on the bulletin board or if a public market for our common stock does not develop, investors may not be able to re-sell the shares of our common stock that they have purchased and may lose all of their investment. If the selling shareholders sell a large number of shares all at once or in blocks, the market price of our shares would most likely decline. The selling shareholders are offering 1,702,800 shares of our common stock through this prospectus. Our common stock is presently not traded on any market or securities exchange, but should a market develop, shares sold at a price below the current market price at which the common stock is trading will cause that market price to decline. Moreover, the offer or sale of a large number of shares at any price may cause the market price to fall. The outstanding shares of common stock covered by this prospectus represent 26.49% of the common shares outstanding as of the date of this prospectus. Because we will be subject to the “Penny Stock” rules once our shares are quoted on the over-the-counter bulletin board, the level of trading activity in our stock may be reduced. Broker-dealer practices in connection with transactions in "penny stocks" are regulated by penny stock rules adopted by the Securities and Exchange Commission. Penny stocks generally are equity securities with a price of less than $5.00 (other than securities registered on some national securities exchanges or quoted on Nasdaq). The penny stock rules require a broker-dealer, prior to a transaction in a penny stock not otherwise exempt from the rules, to deliver a standardized risk disclosure document that provides information about penny stocks and the nature and level of risks in the penny stock market. The broker-dealer also must provide the customer with current bid and offer quotations for the penny stock, the compensation of the broker-dealer and its salesperson in the transaction, and, if the broker-dealer is the sole market maker, the broker-dealer must disclose this fact and the broker-dealer's presumed control over the market, and monthly account statements showing the market value of each penny stock held in the customer's account. In addition, broker-dealers who sell these securities to persons other than established customers and "accredited investors" must make a special written determination that the penny stock is a suitable investment for the purchaser and receive the purchaser's written agreement to the transaction. Consequently, these requirements may have the effect of reducing the level of trading activity, if any, in the secondary market for a security subject to the penny stock rules, and investors in our common stock may find it difficult to sell their shares. In the event that our shares are quoted on the over-the-counter bulletin board, we will be required order to remain current in our filings with the SEC in order for shares of our common stock to be eligible for quotation on the over-the-counter bulletin board. In the event that we become delinquent in our required filings with the SEC, quotation of our common stock will be terminated following a 30 or 60 day grace period if we do not make our required filing during that time. If our shares are not eligible for quotation on the over-the-counter bulletin board, investors in our common stock may find it difficult to sell their shares. If we undertake future offerings of our common stock, purchasers in this offering will experience dilution of their ownership percentage. Generally, existing shareholders will experience dilution of their ownership percentage in the company if and when additional shares of common stock are offered and sold. In the future, we may be required to seek additional equity funding in the form of private or public offerings of our common stock. In the event that we undertake subsequent offerings of common stock, your ownership percentage, voting power as a common shareholder, and earnings per share, if any, will be proportionately diluted. This may, in turn, result in a substantial decrease in the per-share value of your common stock. This prospectus contains forward-looking statements that involve risks and uncertainties. We use words such as anticipate, believe, plan, expect, future, intend and similar expressions to identify such forward-looking statements. The actual results could differ materially from our forward-looking statements. Our actual results are most likely to differ materially from those anticipated in these forward-looking statements for many reasons, including the risks faced by us described in this Risk Factors section and elsewhere in this prospectus. All shares being offered will be sold by existing shareholders without our involvement, consequently the actual price of the stock will be determined by prevailing market prices at the time of sale or by private transactions negotiated by the selling shareholders. The offering price will thus be determined by market factors and the independent decisions of the selling shareholders. The common stock to be sold by the selling shareholders is common stock that is currently issued and outstanding. Accordingly, there will be no dilution to our existing shareholders. The selling shareholders named in this prospectus are offering all of the 1,702,800 shares of common stock offered through this prospectus. All of the shares were acquired from us by the selling shareholders in offerings that were exempt from registration pursuant to Rule 504 of Regulation D of the Securities Act of 1933. The selling shareholders purchased their shares in two offerings completed on March 29, 2010 and May 29, 2010, respectively. 5. the identity of the beneficial holder of any entity that owns the shares. percentages are based on 6,427,800 shares of common stock outstanding on June 30, 2010. None of the selling shareholders: (1) has had a material relationship with us other than as a shareholder at any time within the past three years; or (2) has ever been one of our officers or directors. 5. in any combination of these methods of distribution. 3. such other price as the selling shareholders determine from time to time. The shares may also be sold in compliance with the Securities and Exchange Commission's Rule 144. The selling shareholders may also sell their shares directly to market makers acting as agents in unsolicited brokerage transactions. Any broker or dealer participating in such transactions as an agent may receive a commission from the selling shareholders or from such purchaser if they act as agent for the purchaser. If applicable, the selling shareholders may distribute shares to one or more of their partners who are unaffiliated with us. Such partners may, in turn, distribute such shares as described above. We are bearing all costs relating to the registration of the common stock. The selling shareholders, however, will pay any commissions or other fees payable to brokers or dealers in connection with any sale of the common stock. 3. not bid for or purchase any of our securities or attempt to induce any person to purchase any of our securities other than as permitted under the Securities Exchange Act. We have 75,000,000 common shares with a par value of $0.001 per share of common stock authorized, of which 6,427,800 shares were outstanding as of June 30, 2010. Holders of common stock have the right to cast one vote for each share of stock in his or her own name on the books of the corporation, whether represented in person or by proxy, on all matters submitted to a vote of holders of common stock, including the election of directors. There is no right to cumulative voting in the election of directors. Except where a greater requirement is provided by statute or by the Articles of Incorporation, or by the Bylaws, the presence, in person or by proxy duly authorized, of the holder or holders of a majority of the outstanding shares of the our common voting stock shall constitute a quorum for the transaction of business. The vote by the holders of a majority of such outstanding shares is also required to effect certain fundamental corporate changes such as liquidation, merger or amendment of the Company's Articles of Incorporation. 2. our total assets would be less than the sum of our total liabilities plus the amount that would be needed to satisfy the rights of shareholders who have preferential rights superior to those receiving the distribution. We have not declared any dividends and we do not plan to declare any dividends in the foreseeable future. Holders of common stock are not entitled to pre-emptive or subscription or conversion rights, and there are no redemption or sinking fund provisions applicable to the Common Stock. All outstanding shares of common stock are, and the shares of common stock offered hereby will be when issued, fully paid and non-assessable. We have not issued and do not have outstanding any warrants to purchase shares of our common stock. We have not issued and do not have outstanding any options to purchase shares of our common stock. We have not issued and do not have outstanding any securities convertible into shares of our common stock or any rights convertible or exchangeable into shares of our common stock. Nevada Revised Statutes sections 78.378 to 78.379 provide state regulation over the acquisition of a controlling interest in certain Nevada corporations unless the articles of incorporation or bylaws of the corporation provide that the provisions of these sections do not apply. Our articles of incorporation and bylaws do not state that these provisions do not apply. The statute creates a number of restrictions on the ability of a person or entity to acquire control of a Nevada company by setting down certain rules of conduct and voting restrictions in any acquisition attempt, among other things. The statute is limited to corporations that are organized in the state of Nevada and that have 200 or more stockholders, at least 100 of whom are stockholders of record and residents of the State of Nevada; and does business in the State of Nevada directly or through an affiliated corporation. Because of these conditions, the statute currently does not apply to our company. Puoy K. Premsrirut, Esq., our independent legal counsel, has provided an opinion on the validity of our common stock. Silberstein Ungar, PLLC, Certified Public Accountants, has audited our financial statements included in this prospectus and registration statement to the extent and for the periods set forth in their audit report. Silberstein Ungar , PLLC has presented their report with respect to our audited financial statements. The report of Silberstein Ungar , PLLC is included in reliance upon their authority as experts in accounting and auditing. Richard A. Jeanne, Consulting Geologist has provided a geological evaluation report on the Cutwell Harbour mineral property. He was employed on a flat rate consulting fee and he has no interest, nor does he expect any interest in the property or securities of Queensridge Mining Resources, Inc.
We are an exploration stage company that intends to engage in the exploration of mineral properties. We have acquired a block of mineral claims that we refer to as the Cutwell Harbour property. Exploration of these mineral claims is required before a final determination as to its viability can be made. The property is on Long Island in Notre Dame Bay, Northern Newfoundland. The property comprises 6 claim blocks totaling 150 hectares or approximately 371 acres in area and is located on NTS map sheet 02E/12. Our plan of operations is to carry out exploration work on this claim in order to ascertain whether it possesses commercially exploitable quantities of gold and other metals. We will not be able to determine whether or not the Cutwell Harbour mineral claims contain a commercially exploitable mineral deposit, or reserve, until appropriate exploratory work is done and an economic evaluation based on that work indicates economic viability. Phase I of our exploration program will begin in the Spring of 2011 and will cost approximately $10,614. This phase will consist of on-site surface reconnaissance, mapping, sampling, and geochemical analyses. Phase II of our program will consist of on-site mapping, sampling, and followed by geochemical analyses of the various samples gathered. Phase II of our exploration program will cost approximately $16,767, and is expected commence in the late Summer or early Fall of 2011. The existence of commercially exploitable mineral deposits in the Cutwell Harbour property is unknown at the present time and we will not be able to ascertain such information until we receive and evaluate the results of our exploration program. Acquisition of the Cutwell Harbour mineral claims. We have acquired a 100% interest in the Cutwell Harbour mineral claims located in northern Newfoundland, Canada. Our ownership in the Cutwell Harbor claims was electronically staked and recorded under the electronic mineral claim staking and recording procedures of the Online Mineral Claims Staking System administered by the Department of Natural Resources, Government of Newfoundland and Labrador, Canada. A party is able to stake and record an interest in a particular mineral claim if no other party has an interest in the said claim that is in good standing and on record. There is no formal agreement between us and/or our subsidiary and the Government of Newfoundland and Labrador. The Cutwell Harbor claims are administered under the Mineral Act of Newfoundland and Labrador. Our interest in the Cutwell Harbor claims will continue for up to twenty years provided that the minimum required expenditures toward exploration work on the claim are made in compliance with the Act. The required amount of expenditures toward exploration work is set by the Province of Newfoundland and Labrador and can be altered in its sole discretion. Currently, the amount required to be expended annually for exploration work within the first year that the mineral claim is acquired is $200 per claim. The required expenditures per claim increase gradually each year up to a maximum of $1,200 per claim for the sixteenth year and beyond. Within 60 days following the anniversary date of the claim, an assessment report on the work performed must be submitted to the Mineral Claims Recorder. Every five years, renewal fee of between $25 and $100 per claim is also required. We selected the Cutwell Harbour mineral property based upon an independent geological report which was commissioned from Richard A. Jeanne, a Consulting Geologist. Mr. Jeanne recommended an exploration program on this claim which will cost us approximately $27,381. 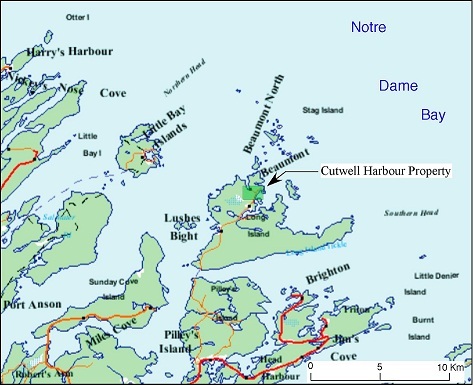 The Cutwell Harbour property is located on Long Island in Notre Dame Bay, on the north coast of Newfoundland, Canada (fig. 1). It comprises 150 hectares (≈ 371 acres), approximately centered at latitude 49° 36’ 55.8" North, longitude 55° 40’ 54.1" West (UTM Zone 21, 595230E – 5496497N). It lies within the area covered by NTS map sheet 02E/12. Beginning at the Northeast corner of the herein described parcel of land, and said corner having UTM coordinates of 5 497 000 N, 596 000 E; of Zone 21; thence South 1,000 metres, thence West 1,500 metres, thence North 1,000 metres, thence East 1,500 metres to the point of beginning. All bearings are referred to the UTM grid, Zone 21. NAD27. The Government of Newfoundland and Labrador owns the land covered by the Cutwell Harbour mineral claims. Currently, we are not aware of any native land claims that might affect the title to the mineral claim or to Newfoundland and Labrador’s title of the property. Although we are unaware of any situation that would threaten this claim, it is possible that a native land claim could be made in the future. The federal and provincial government policy at this time is to consult with all potentially affected native bands and other stakeholders in the area of any potential commercial production. If we should encounter a situation where a native person or group claims and interest in this claim, we may choose to provide compensation to the affected party in order to continue with our exploration work, or if such an option is not available, we may have to relinquish any interest that we hold in this claim. We have obtained an independent Geological Report and have acquired a 100% ownership interest in the Cutwell Harbour mineral claims. Richard A. Jeanne, Consulting Geologist, has prepared this Geological Report and reviewed all available exploration data completed on this mineral claim. Mr. Jeanne is a geologist with offices at 3055 Natalie Street, Reno Nevada, 89509. He has a B.S. in Geology from Northern Arizona University and an M.A. in Geology from Boston University with over 27 years experience since graduation. Mr. Jeanne is a Certified Professional Geologist with the American Institute of Professional Geologists (Certificate Number 8397). The property that is the subject of the Cutwell Harbour mineral claims is undeveloped and does not contain any open-pit or underground mines which can be rehabilitated. There is no commercial production plant or equipment located on the property that is the subject of the mineral claim. Currently, there is no power supply to the mineral claims. We have not yet commenced the field work phase of our initial exploration program. Exploration is currently in the planning stages. Our exploration program is exploratory in nature and there is no assurance that mineral reserves will be found. The details of the Geological Report are provided below. A primary purpose of the geological report is to review information, if any, from the previous exploration of the mineral claims and to recommend exploration procedures to establish the feasibility of commercial production project on the mineral claims. The summary report lists results of the history of the exploration of the mineral claims, the regional and local geology of the mineral claims and the mineralization and the geological formations identified as a result of the prior exploration. The summary report also gave conclusions regarding potential mineralization of the mineral claims and recommended a further geological exploration program. The property is located near the community of Beaumont on Long Island, in Notre Dame Bay, just off the north coast of Newfoundland on NTS map sheet 02E/12. Access to the property can be gained from the Trans-Canada Highway at South Brook via route 380 to Pilley’s island then north via secondary roads and ferry to Long Island and the community of Beaumont. The region receives abundant snowfall during the winter months, making geological exploration and other related activities impractical during this time. The climate during the remainder of the year is moderate. The topography is moderately rugged with elevations ranging from sea level to about 140 meters. Although some portions of the property are wooded, in general, vegetative and soil cover is sparse, providing good bedrock exposure. In 1980, Brinco Mining, Ltd. and Getty Mines Limited formed a joint venture and conducted reconnaissance exploration that included geological, geochemical and geophysical surveys in the vicinity of the Cutwell Harbour Property. In response to the discovery of several base metal occurrences in felsic volcanic rocks during this program, Getty Canadian Minerals engaged Tillicum Resources Ltd in 1983 to conduct geologic mapping, sampling and geophysical surveys over other areas of Long Island that are underlain by these rock types. A number of additional base metal anomalies were identified during this program, and in 1990, northern Long Island was staked under license 3948, issued to Eastern Goldfields. Continued exploration on this claim by Tillicum Resources for Eastern Goldfields led to the discovery of anomalous gold (1072 ppb) at Cutwell Harbour. These claims were relinquished by Eastern Goldfields in 1993. Most rock chip sampling conducted by Tillicum Resources was concentrated within an area less that 20 by 60 meters in dimension with the exception of one sample collected about 100 meters along strike on the mineralized unit. An anomalous gold value of 1072 ppb was returned for one of the clustered samples and a value of 225 ppb for the sample collected 100 meters distant. The 1072 ppb sample is notable as it was not collected from a single site, but over a 10 meter interval. The elevated values indicate potential for economic grades of gold mineralization over significant portions of this unit. Widespread silicification and pyritization coupled with the proximity of a possible source of mineralization in the form of the nearby felsic stock lend further support to this potential. The clustering of samples taken to date has not delineated the aerial extent nor defined the nature of mineralization. It is known that the region has been subjected to extensive structural deformation so the possibility of vein or stockwork mineralization exists. Armed with our present understanding of this gold occurrence, the potential for economic mineralization could be evaluated relatively easily through a mapping and sampling program. No visit to the property has yet been made by us or our consulting geologist. In order to evaluate the exploration potential of the Cutwell Harbour claims, our consulting geologist has recommended on site surface reconnaissance, mapping and sampling to be followed by geochemical analyses of the samples to be taken. The primary goal of the exploration program is to identify sites for additional gold exploration. While we have not commenced the field work phase of our initial exploration program, we intend to proceed with the initial exploratory work as recommended. We expect that Phase I will begin in the Spring of 2011, with Phase II to begin in the late Summer or Fall of 2011. Upon our review of the results, we will assess whether the results are sufficiently positive to warrant additional phases of the exploration program. We will make the decision to proceed with any further programs based upon our consulting geologist’s review of the results and recommendations. In order to complete significant additional exploration beyond the currently planned Phase I and Phase II, we will need to raise additional capital. The mineral exploration industry, in general, is intensely competitive and even if commercial quantities of reserves are discovered, a ready market may not exist for the sale of the reserves. Most companies operating in this industry are more established and have greater resources to engage in the production of mineral claims. We were incorporated on January 29, 2010 and our operations are not well-established. Our resources at the present time are limited. We may exhaust all of our resources and be unable to complete full exploration of the Cutwell Harbour mineral claims. There is also significant competition to retain qualified personnel to assist in conducting mineral exploration activities. If a commercially viable deposit is found to exist and we are unable to retain additional qualified personnel, we may be unable to enter into production and achieve profitable operations. These factors set forth above could inhibit our ability to compete with other companies in the industry and entered into production of the mineral claim if a commercial viable deposit is found to exist. Numerous factors beyond our control may affect the marketability of any substances discovered. These factors include market fluctuations, the proximity and capacity of natural resource markets and processing equipment, government regulations, including regulations relating to prices, taxes, royalties, land tenure, land use, importing and exporting of minerals and environmental protection. The exact effect of these factors cannot be accurately predicted, but the combination of these factors may result our not receiving an adequate return on invested capital. The main agency that governs the exploration of minerals in the Province of Newfoundland and Labrador is the Department of Natural Resources. The Department of Natural Resources manages the development of Newfoundland and Labrador’s mineral resources, and implements policies and programs respecting their development while protecting the environment. In addition, the Department regulates and inspects the exploration and mineral production industries in Newfoundland and Labrador to protect workers, the public and the environment. The material legislation applicable to Queensridge Mining Resources, Inc. is the Mineral Act of Newfoundland and Labrador. Any person who intends to conduct an exploration program on a staked or licensed area must submit prior notice with a detailed description of the activity to the Department of Natural Resources. An exploration program that may result in major ground disturbance or disruption to wildlife or wildlife habitat must have an Exploration Approval from the department before the activity can commence. We will also have to sustain the cost of reclamation and environmental remediation for all exploration work undertaken. Both reclamation and environmental remediation refer to putting disturbed ground back as close to its original state as possible. Other potential pollution or damage must be cleaned-up and renewed along standard guidelines outlined in the usual permits. Reclamation is the process of bringing the land back to its natural state after completion of exploration activities. Environmental remediation refers to the physical activity of taking steps to remediate, or remedy any environmental damage caused such as refilling trenches after sampling or cleaning up fuel spills. Our initial exploration program does not require any reclamation or remediation because of minimal disturbance to the ground. The amount of these costs is not known at this time because we do not know the extent of the exploration program we will undertake, beyond completion of the recommended exploration phase described above, or if we will enter into production on the property. Because there is presently no information on the size, tenor, or quality of any resource or reserve at this time, it is impossible to assess the impact of any capital expenditures on our earnings or competitive position in the event a potentially-economic deposit is discovered. We have no employees as of the date of this prospectus other than our president and CEO, Mr. Stromer. We conduct our business largely through agreements with consultants and other independent third party vendors. We have not incurred any research or development expenditures since our incorporation. We do not currently have any subsidiaries. The Cutwell Harbour property is located on Long Island in Notre Dame Bay, on the north coast of Newfoundland, Canada (fig. 1). It comprises 150 hectares (≈ 371 acres), approximately centered at latitude 49° 36’ 55.8" North, longitude 55° 40’ 54.1" West (UTM Zone 21, 595230E – 5496497N). It lies within the area covered by NTS map sheet 02E/12. The boundaries of the property are described as follows: Beginning at the Northeast corner of the herein described parcel of land, and said corner having UTM coordinates of 5 497 000 N, 596 000 E; of Zone 21; thence South 1,000 metres, thence West 1,500 metres, thence North 1,000 metres, thence East 1,500 metres to the point of beginning. All bearings are referred to the UTM grid, Zone 21. NAD27. Figure 2. Claim Layout. Cutwell Harbour property shown in green. We are not currently a party to any legal proceedings. We are not aware of any pending legal proceeding to which any of our officers, directors, or any beneficial holders of 5% or more of our voting securities are adverse to us or have a material interest adverse to us. Our agent for service of process in Nevada is Val-U-Corp Services, Inc., 1802 N. Carson St., #212, Carson City, NV 89701. No Public Market for Common Stock. There is presently no public market for our common stock. We anticipate making an application for trading of our common stock on the over the counter bulletin board upon the effectiveness of the registration statement of which this prospectus forms a part. We can provide no assurance that our shares will be traded on the bulletin board, or if traded, that a public market will materialize. The Securities Exchange Commission has adopted rules that regulate broker-dealer practices in connection with transactions in penny stocks. Penny stocks are generally equity securities with a price of less than $5.00, other than securities registered on certain national securities exchanges or quoted on the NASDAQ system, provided that current price and volume information with respect to transactions in such securities is provided by the exchange or system. The penny stock rules require a broker-dealer, prior to a transaction in a penny stock, to deliver a standardized risk disclosure document prepared by the Commission, that: (a) contains a description of the nature and level of risk in the market for penny stocks in both public offerings and secondary trading;(b) contains a description of the broker's or dealer's duties to the customer and of the rights and remedies available to the customer with respect to a violation to such duties or other requirements of Securities' laws; (c) contains a brief, clear, narrative description of a dealer market, including bid and ask prices for penny stocks and the significance of the spread between the bid and ask price;(d) contains a toll-free telephone number for inquiries on disciplinary actions;(e) defines significant terms in the disclosure document or in the conduct of trading in penny stocks; and;(f) contains such other information and is in such form, including language, type, size and format, as the Commission shall require by rule or regulation. The broker-dealer also must provide, prior to effecting any transaction in a penny stock, the customer with; (a) bid and offer quotations for the penny stock;(b) the compensation of the broker-dealer and its salesperson in the transaction;(c) the number of shares to which such bid and ask prices apply, or other comparable information relating to the depth and liquidity of the market for such stock; and (d) a monthly account statements showing the market value of each penny stock held in the customer's account. In addition, the penny stock rules require that prior to a transaction in a penny stock not otherwise exempt from those rules; the broker-dealer must make a special written determination that the penny stock is a suitable investment for the purchaser and receive the purchaser's written acknowledgment of the receipt of a risk disclosure statement, a written agreement to transactions involving penny stocks, and a signed and dated copy of a written suitability statement. These disclosure requirements may have the effect of reducing the trading activity in the secondary market for our stock if it becomes subject to these penny stock rules. Therefore, because our common stock is subject to the penny stock rules, stockholders may have difficulty selling those securities. Currently, we have thirty (30) holders of record of our common stock. None of our common stock is currently available for resale to the public under Rule 144. In general, under Rule 144 as currently in effect, a person who has beneficially owned shares of a company's common stock for at least 180 days is entitled to sell his or her shares. However, Rule 144 is not available to shareholders for at least one year subsequent to an issuer that previously met the definition of Rule 144(i)(1)(i) having publicly filed, on Form 8K, the information required by Form 10. As of the date of this prospectus, no selling shareholder has held their shares for more than 180 days and it has not been at least one year since the company filed the Form 10 Information on Form 8K as contemplated by Rule 144(i)(2) and (3). Sales under Rule 144 are also subject to manner of sale provisions and notice requirements and to the availability of current public information about the company. We are paying the expenses of the offering because we seek to: (i) become a reporting company with the Commission under the Securities Exchange Act of 1934; and (ii) enable our common stock to be traded on the over-the-counter bulletin board. We plan to file a Form 8-A registration statement with the Commission to cause us to become a reporting company with the Commission under the 1934 Act. We must be a reporting company under the 1934 Act in order that our common stock is eligible for trading on the over-the-counter bulletin board. We believe that the registration of the resale of shares on behalf of existing shareholders may facilitate the development of a public market in our common stock if our common stock is approved for trading on a recognized market for the trading of securities in the United States. We consider that the development of a public market for our common stock will make an investment in our common stock more attractive to future investors. In the near future, in order for us to continue with our mineral exploration program, we will need to raise additional capital. We believe that obtaining reporting company status under the 1934 Act and trading on the OTCBB should increase our ability to raise these additional funds from investors. We have audited the accompanying balance sheet of Queensridge Mining Resources, Inc. as of June 30, 2010, and the related statements of operations, stockholders’ equity, and cash flows for the period from January 29, 2010 (date of inception) to June 30, 2010. These financial statements are the responsibility of the Company’s management. Our responsibility is to express an opinion on these financial statements based on our audit. We conducted our audit in accordance with the standards of the Public Company Accounting Oversight Board (United States). Those standards require that we plan and perform the audit to obtain reasonable assurance about whether the financial statements are free of material misstatement. The Company has determined that it is not required to have, nor were we engaged to perform, an audit of its internal control over financial reporting. Our audit included consideration of internal control over financial reporting as a basis for designing audit procedures that are appropriate in the circumstances, but not for the purpose of expressing an opinion on the effectiveness of the Company’s internal control over financial reporting. Accordingly, we express no such opinion. An audit includes examining on a test basis, evidence supporting the amounts and disclosures in the financial statements. An audit also includes assessing the accounting principles used and significant estimates made by management, as well as evaluating the overall financial statement presentation. We believe that our audit provide a reasonable basis for our opinion. In our opinion, the financial statements referred to above present fairly, in all material respects, the financial position of Queensridge Mining Resources, Inc., as of June 30, 2010 and the results of their operations and cash flows for the period from January 29, 2010 (date of inception) to June 30, 2010, in conformity with accounting principles generally accepted in the United States of America. The accompanying financial statements have been prepared assuming that Queensridge Mining Resources, Inc. will continue as a going concern. As discussed in Note 8 to the financial statements, the Company has incurred losses from operations, has limited working capital, and is in need of additional capital to grow its operations so that it can become profitable. These factors raise substantial doubt about the Company’s ability to continue as a going concern. Management’s plans with regard to these matters are described in Note 8. The accompanying financial statements do not include any adjustments that might result from the outcome of this uncertainty. Queensridge Mining Resources, Inc. (“Queensridge” or the “Company”) was incorporated in Nevada on January 29, 2010. Queensridge is an exploration stage company and has not yet realized any revenues from its planned operations. Queensridge is currently in the process of acquiring certain mining claims. The accompanying financial statements have been prepared in accordance with generally accepted accounting principles related to exploration stage companies. An exploration stage company is one in which planned principal operations have not commenced, or, if its operations have commenced, there have been no significant revenues there from. The financial statements of the Company have been prepared in accordance with generally accepted accounting principles in the United States of America and are presented in US dollars. The Company uses the accrual basis of accounting and accounting principles generally accepted in the United States of America (“GAAP” accounting). The Company has adopted a June 30 fiscal year end. The Company considers all highly liquid investments with maturities of three months or less to be cash equivalents. At June 30, 2010 the Company had cash balances totaling $35,065. The Company’s financial instruments consist of cash and cash equivalents, accrued expenses and loans payable to a related party. The carrying amount of these financial instruments approximates fair value due either to length of maturity or interest rates that approximate prevailing market rates unless otherwise disclosed in these financial statements. Income taxes are computed using the asset and liability method. Under the asset and liability method, deferred income tax assets and liabilities are determined based on the differences between the financial reporting and tax bases of assets and liabilities and are measured using the currently enacted tax rates and laws. A valuation allowance is provided for the amount of deferred tax assets that, based on available evidence, are not expected to be realized. The preparation of financial statements in conformity with generally accepted accounting principles requires management to make estimates and assumptions that affect the reported amounts of assets and liabilities and disclosure of contingent assets and liabilities at the date the financial statements and the reported amount of revenues and expenses during the reporting period. Actual results could differ from those estimates. Basic income (loss) per share is calculated by dividing the Company’s net loss applicable to common shareholders by the weighted average number of common shares during the period. Diluted earnings per share is calculated by dividing the Company’s net income available to common shareholders by the diluted weighted average number of shares outstanding during the year. The diluted weighted average number of shares outstanding is the basic weighted number of shares adjusted for any potentially dilutive debt or equity. There are no such common stock equivalents outstanding as of June 30, 2010. The Company recognizes revenue when products are fully delivered or services have been provided and collection is reasonably assured. Stock-based compensation is accounted for at fair value in accordance with SFAS No. 123 and 123 (R) (ASC 718). To date, the Company has not adopted a stock option plan and has not granted any stock options. The Company does not expect the adoption of recently issued accounting pronouncements to have a significant impact on the Company’s results of operations, financial position or cash flow. Costs of exploration and the costs of carrying and retaining unproven mineral lease properties are expensed as incurred. Mineral property acquisition costs are capitalized including licenses and lease payments. Although the Company has taken steps to verify title to mineral properties in which it has an interest, these procedures do not guarantee the Company's title. Such properties may be subject to prior agreements or transfers and title may be affected by undetected defects. Impairment losses are recorded on mineral properties used in operations when indicators of impairment are present and the undiscounted cash flows estimated to be generated by those assets are less than the assets’ carrying amount. Queensridge is currently in the process of acquiring certain mining claims. Exploration costs totaled $3,000 for the period ended June 30, 2010. During the period ended June 30, 2010, the company received advances from a shareholder totaling $1,650. The loan has no specific terms of repayment. On February 8, 2010, the Company issued 3,100,000 founder shares at $0.001 (par value) for cash totaling $3,100. On March 29, 2010, the Company issued 3,250,000 shares at $0.005 for cash totaling $16,250. On May 29, 2010, the Company issued 77,800 shares at $0.25 for cash totaling $19,450. As of June 30, 2010, the Company has not issued any stock options or warrants. For the period ended June 30, 2010, the Company has incurred net losses and, therefore, has no tax liability. The net deferred tax asset generated by the loss carry-forward has been fully reserved. The cumulative net operating loss carry-forward is approximately $11,500 at June 30, 2010, and will expire beginning in the year 2029. The Company leases its office facilities under a lease which expires February 1, 2012. The monthly rate is $310. The lease is renewable for an additional two year term at the same monthly rate. Rent expense for the fiscal year ended June 30, 2010 totaled $1,550. The Company has negative working capital, has incurred losses since inception, and has not yet received revenues from sales of products or services. These factors create substantial doubt about the Company’s ability to continue as a going concern. The financial statements do not include any adjustment that might be necessary if the Company is unable to continue as a going concern. The ability of Queensridge to continue as a going concern is dependent upon the Company generating cash from the sale of its common stock and/or obtaining debt financing and attaining future profitable operations. Management’s plans include selling its equity securities and obtaining debt financing to fund its capital requirement and ongoing operations; however, there can be no assurance the Company will be successful in these efforts. Management has evaluated subsequent events through August 2, 2010, the date on which the financial statements were issued, and has determined it does not have any material subsequent events to disclose. We were incorporated on January 29, 2010, under the laws of the state of Nevada. We hold a 100% interest in the Cutwell Harbour mineral claims, located in Newfoundland, Canada. Mr. Phillip Stromer is our President, CEO, Secretary, Treasurer, and sole director. Our business plan is to proceed with the exploration of the Cutwell Harbour mineral claims to determine whether there are commercially exploitable reserves of gold or other metals. We intend to proceed with the initial exploration program as recommended by our consulting geologist. The recommended geological program will cost a total of approximately $27,381. We had $35,065 in cash as of June 30, 2010. Our plan of operations for the twelve months following the date of this prospectus is to complete the recommended exploration program on the Cutwell Harbour mineral claims. Phase I would consist of on-site surface reconnaissance, mapping, sampling, and geochemical analyses. This phase of the program will cost approximately $10,614. We anticipate commencing this phase of exploration in the Spring of 2011. Phase II would entail additional mapping and sampling followed by geochemical analyses of the various samples gathered. The Phase II program will cost approximately $16,767. We anticipate commencing this phase in the late Summer or Fall of 2011. We have not retained a geologist to conduct any of the anticipated exploration work. In the next 12 months, we also anticipate spending an additional $20,000 on administrative expenses, including fees payable in connection with the filing of this registration statement and complying with reporting obligations. Total expenditures over the next 12 months are therefore expected to be approximately $47,000. Once we receive the analyses of our initial exploration program, our board of directors, in consultation with our consulting geologist will assess whether to proceed with additional mineral exploration programs. In making this determination to proceed with a further exploration, we will make an assessment as to whether the results of the initial program are sufficiently positive to enable us to proceed. This assessment will include an evaluation of our cash reserves after the completion of the initial exploration, the price of minerals, and the market for the financing of mineral exploration projects at the time of our assessment. In the event our board of directors, in consultation with our consulting geologist, chooses to conduct further mineral exploration programs beyond the initial program, we will require additional financing. While we have sufficient funds on hand to cover the currently planned exploration costs, we will require additional funding in order to undertake further exploration programs on the Cutwell Harbour mineral claims and to cover all of our anticipated administrative expenses. In the event that additional exploration programs on the Cutwell Harbour mineral claims are undertaken, we anticipate that additional funding will be required in the form of equity financing from the sale of our common stock and from loans from our director. We cannot provide investors with any assurance, however, that we will be able to raise sufficient funding from the sale of our common stock to fund all of our anticipated expenses. We do not have any arrangements in place for any future equity financing. We believe that outside debt financing will not be an alternative for funding exploration programs on the Cutwell Harbour property. The risky nature of this enterprise and lack of tangible assets other than our mineral claim places debt financing beyond the credit-worthiness required by most banks or typical investors of corporate debt until such time as an economically viable mine can be demonstrated. In the event the results of our initial exploration program proves not to be sufficiently positive to proceed with further exploration on the Cutwell Harbour mineral claims, we intend to seek out and acquire interests in North American mineral exploration properties which, in the opinion of our consulting geologist, offer attractive mineral exploration opportunities. Presently, we have not given any consideration to the acquisition of other exploration properties because we have not yet commenced our initial exploration program and have not received any results. During this exploration stage Mr. Stromer, our President, will only be devoting approximately five to ten hours per week of his time to our business. We do not foresee this limited involvement as negatively impacting our company over the next twelve months as all exploratory work is being performed by outside consultants. If, however, the demands of our business require more business time of Mr. Stromer such as raising additional capital or addressing unforeseen issues with regard to our exploration efforts, he is prepared to devote more time to our business. However, he may not be able to devote sufficient time to the management of our business, as and when needed. We do not have plans to purchase any significant equipment or change the number of our employees during the next twelve months. As of June 30, 2010, there were no off balance sheet arrangements. We did not earn any revenues from inception through the fiscal year ending June 30, 2010. We do not anticipate earning revenues until such time that we exercise our option entered into commercial production of the Cutwell Harbour mineral property. We are presently about to begin the exploration stage of our business and we can provide no assurance that we will discover commercially exploitable levels of mineral resources on the Cutwell Harbour mineral property, or if such resources are discovered, that we will enter into commercial production. We incurred operating expenses in the amount of $11,545 from our inception on January 29, 2010, until June 30, 2010. These operating expenses consisted of general and administrative expenses. We anticipate our operating expenses will increase as we undertake our plan of operations. The increase will be attributable to undertaking our geological exploration program and the professional fees that we will incur in connection with the filing of a registration statement with the Securities Exchange Commission under the Securities Act of 1933. We anticipate our ongoing operating expenses will also increase once we become a reporting company under the Securities Exchange Act of 1934. As of June 30, 2010, we had cash of $35,065 and operating capital of $27,255. As discussed above, the two phases exploration work currently planned for the Cutwell Harbour property will cost approximately $27,381. In addition, we also anticipate spending an additional $20,000 on administrative expenses over the next 12 months, including fees payable in connection with the filing of this registration statement and complying with reporting obligations. We expect that our current cash on hand, should be sufficient to fund Phase I of our planned exploration programs and to meet our expected legal and accounting expenses for the first two-three quarters of our fiscal year beginning June 30, 2010. Our sole officer and largest shareholder, Phillip Stromer, has committed to fund our legal and accounting compliance expenses through additional infusions of equity or debt capital on an as-needed basis. We anticipate that Mr. Stromer will fund any shortfall we may experience in funds available to pay future legal and accounting compliance expenses and we do not currently expect to solicit additional outside investment in the form of debt or equity for that purpose. We have not attained profitable operations and are dependent upon obtaining financing to pursue significant exploration activities beyond those planned for the current fiscal year. For these reasons, our auditors stated in their report that they have substantial doubt we will be able to continue as a going concern. We have had no changes in or disagreements with our accountants. Set forth below is a brief description of the background and business experience of each of our current executive officers and directors. Phillip Stromer. Mr. Stromer is our CEO, CFO, President, Secretary, Treasurer and sole director. Mr. Stromer has been a professional pilot since 1990 and currently serves as a captain with a major U.S. airline. Prior to his career as a pilot, Mr. Stromer worked as a civil engineer for Marin County, California where he focused on subdivision design, project management, and project cost analysis and estimating. Mr. Stromer holds a B.S. in civil engineering from California State University, Chico. Our bylaws authorize no less than one (1) director. We currently have one Director. Phillip Stromer is our only employee. A verbal agreement with our consulting geologist provides that he will review all of the results from the exploratory work performed upon the site and make recommendations based on those results in exchange for payments equal to the usual and customary rates received by geologist firms performing similar consulting services. Verbal agreements with our accountants to perform requested financial accounting services. Written agreements with auditors to perform audit functions at their respective normal and customary rates. Our current named executive officer holds substantial ownership in the Company and is motivated by a strong entrepreneurial interest in developing our operations and potential revenue base to the best of his ability. As our business and operations expand and mature, we may develop a formal system of compensation designed to attract, retain and motivate talented executives. The table below summarizes all compensation awarded to, earned by, or paid to each named executive officer for our last two completed fiscal years for all services rendered to us. Our named executive officers do not currently receive any compensation from the Company for their service as officers of the Company. The table below summarizes all unexercised options, stock that has not vested, and equity incentive plan awards for each named executive officer outstanding as of the end of our last completed fiscal year. The table below summarizes all compensation paid to our directors for our last completed fiscal year. Our directors do not currently receive any compensation from the Company for their service as members of the Board of Directors of the Company. The following table sets forth, as of June 30, 2010, the beneficial ownership of our common stock by each executive officer and director, by each person known by us to beneficially own more than 5% of the our common stock and by the executive officers and directors as a group. Except as otherwise indicated, all shares are owned directly and the percentage shown is based on 6,427,800 shares of common stock issued and outstanding on June 30, 2010. As used in this table, "beneficial ownership" means the sole or shared power to vote, or to direct the voting of, a security, or the sole or shared investment power with respect to a security (i.e., the power to dispose of, or to direct the disposition of, a security). In addition, for purposes of this table, a person is deemed, as of any date, to have "beneficial ownership" of any security that such person has the right to acquire within 60 days after such date. The persons named above have full voting and investment power with respect to the shares indicated. Under the rules of the Securities and Exchange Commission, a person (or group of persons) is deemed to be a "beneficial owner" of a security if he or she, directly or indirectly, has or shares the power to vote or to direct the voting of such security, or the power to dispose of or to direct the disposition of such security. Accordingly, more than one person may be deemed to be a beneficial owner of the same security. A person is also deemed to be a beneficial owner of any security, which that person has the right to acquire within 60 days, such as options or warrants to purchase our common stock. In accordance with the provisions in our articles of incorporation, we will indemnify an officer, director, or former officer or director, to the full extent permitted by law. Insofar as indemnification for liabilities arising under the Securities Act of 1933 (the "Act") may be permitted to our directors, officers and controlling persons pursuant to the foregoing provisions, or otherwise, we have been advised that in the opinion of the Securities and Exchange Commission such indemnification is against public policy as expressed in the Act and is, therefore, unenforceable. In the event that a claim for indemnification against such liabilities (other than the payment by us of expenses incurred or paid by a director, officer or controlling person of us in the successful defense of any action, suit or proceeding) is asserted by such director, officer or controlling person in connection with the securities being registered, we will, unless in the opinion of our counsel the matter has been settled by controlling precedent, submit to a court of appropriate jurisdiction the question whether such indemnification by it is against public policy as expressed in the Securities Act and will be governed by the final adjudication of such issue. Any relative or spouse of any of the foregoing persons who has the same house address as such person. 1. We are party to a Commercial Lease Agreement with the PKS Trust, an entity for which our sole officer and director, Phillip Stromer, is a Trustee. Under the Commercial Lease Agreement, we rent certain square footage at 912 Sir James Bridge Way, Las Vegas, Nevada 89145 for use as our executive offices at a rate of $310.00 per month. We have filed a registration statement on form S-1 under the Securities Act of 1933 with the Securities and Exchange Commission with respect to the shares of our common stock offered through this prospectus. This prospectus is filed as a part of that registration statement, but does not contain all of the information contained in the registration statement and exhibits. Statements made in the registration statement are summaries of the material terms of the referenced contracts, agreements or documents of the company. We refer you to our registration statement and each exhibit attached to it for a more detailed description of matters involving the company. You may inspect the registration statement, exhibits and schedules filed with the Securities and Exchange Commission at the Commission's principal office in Washington, D.C. Copies of all or any part of the registration statement may be obtained from the Public Reference Section of the Securities and Exchange Commission, 450 Fifth Street, N.W., Washington, D.C. 20549. Please Call the Commission at 1-800-SEC-0330 for further information on the operation of the public reference rooms. The Securities and Exchange Commission also maintains a web site at http://www.sec.gov that contains reports, proxy Statements and information regarding registrants that files electronically with the Commission. Our registration statement and the referenced exhibits can also be found on this site. If we are not required to provide an annual report to our security holders, we intend to still voluntarily do so when otherwise due, and will attach audited financial statements with such report. Until ________________, all dealers that effect transactions in these securities whether or not participating in this offering may be required to deliver a prospectus. This is in addition to the dealers' obligation to deliver a prospectus when acting as underwriters and with respect to their unsold allotments or subscriptions. All amounts are estimates, other than the Commission's registration fee. We are paying all expenses of the offering listed above. No portion of these expenses will be borne by the selling shareholders. The selling shareholders, however, will pay any other expenses incurred in selling their common stock, including any brokerage commissions or costs of sale. Our officers and directors are indemnified as provided by the Nevada Revised Statutes and our bylaws. such indemnification is required to be made pursuant to the bylaws. Our bylaws provide that we will advance to any person who was or is a party or is threatened to be made a party to any threatened, pending or completed action, suit or proceeding, whether civil, criminal, administrative or investigative, by reason of the fact that he is or was a director or officer, of the company, or is or was serving at the request of the company as a director or executive officer of another company, partnership, joint venture, trust or other enterprise, prior to the final disposition of the proceeding, promptly following request therefore, all expenses incurred by any director or officer in connection with such proceeding upon receipt of an undertaking by or on behalf of such person to repay said amounts if it should be determined ultimately that such person is not entitled to be indemnified under our bylaws or otherwise. Our bylaws provide that no advance shall be made by us to an officer of the company, except by reason of the fact that such officer is or was a director of the company in which event this paragraph shall not apply, in any action, suit or proceeding, whether civil, criminal, administrative or investigative, if a determination is reasonably and promptly made: (a) by the board of directors by a majority vote of a quorum consisting of directors who were not parties to the proceeding, or (b) if such quorum is not obtainable, or, even if obtainable, a quorum of disinterested directors so directs, by independent legal counsel in a written opinion, that the facts known to the decision-making party at the time such determination is made demonstrate clearly and convincingly that such person acted in bad faith or in a manner that such person did not believe to be in or not opposed to the best interests of the company. We closed an issue to 3,100,000 shares of common stock on February 8, 2010 to our sole officer and director, Phillip Stromer, at a price of $0.001 per share. The total proceeds received from this offering were $3,100. These shares were issued pursuant to Section 4(2) of the Securities Act of 1933 and are restricted shares as defined in the Securities Act. We did not engage in any general solicitation or advertising. We completed an offering of 3,250,000 shares of our common stock at a price of $0.005 per share to a total of sixteen (16) purchasers on March 29, 2010. The total amount we received from this offering was $16,250. We completed an offering of 77,800 shares of our common stock at $0.25 per share to a total of thirteen (13) purchasers on May 29, 2010. The total amount we received from this offering was $19,450. The identity of the purchasers from both of these offerings is included in the selling shareholder table set forth above. We completed both of these offerings pursuant Rule 504 of Regulation D of the Securities Act of 1933. (c) to include any material information with respect to the plan of distribution not previously disclosed in this registration statement or any material change to such information in the registration statement. 2. That, for the purpose of determining any liability under the Securities Act, each such post-effective amendment shall be deemed to be a new registration statement relating to the securities offered herein, and the offering of such securities at that time shall be deemed to be the initial bona fide offering thereof. 3. To remove from registration by means of a post-effective amendment any of the securities being registered hereby which remain unsold at the termination of the offering. Insofar as indemnification for liabilities arising under the Securities Act of 1933 may be permitted to our directors, officers and controlling persons pursuant to the provisions above, or otherwise, we been advised that in the opinion of the Securities and Exchange Commission such indemnification is against public policy as expressed in the Securities Act of 1933, and is, therefore, unenforceable. In the event that a claim for indemnification against such liabilities, other than the payment by us of expenses incurred or paid by one of our directors, officers, or controlling persons in the successful defense of any action, suit or proceeding, is asserted by one of our directors, officers, or controlling persons in connection with the securities being registered, we will, unless in the opinion of its counsel the matter has been settled by controlling precedent, submit to a court of appropriate jurisdiction the question whether such indemnification is against public policy as expressed in the Securities Act of 1933, and we will be governed by the final adjudication of such issue. In accordance with the requirements of the Securities Act of 1933, the registrant certifies that it has reasonable grounds to believe that it meets all of the requirements for filing on Form S-1 and authorized this registration statement to be signed on its behalf by the undersigned, in Las Vegas, Nevada, on August 11, 2010.